The one thing I hate about busy days is that one doesn’t get to sit down and properly enjoy one’s lunch. I hate rushed meals, you see. So on days when I am swamped, I just eat cookies or brownies for lunch and make up for it with two delicious dinners when I get home. I know, however, that this isn’t the healthiest way to go about things. And sometimes, I miss being able to eat something spicy and not-sweet for lunch (followed by a brownie, of course). That’s where this roll comes in. Rotis (for more on how to make rotis, go here; you can also use tortillas or buy pre-made rotis at an Indian store). Take the Paneer and chop it up into little small pieces. You can also process it in a food processor until it is broken up into fairly small chunks (not larger than 1/2 inch cubes). Add the oil/ghee to a frying pan. Heat the pan at medium-high heat. Once the oil seems hot (test it with one small onion piece) thrown in the diced onions and sauté them until they are slightly browned. Throw in the green chilli and sauté it as well. Reduce the heat to medium. Add the tomatoes and toss them about in the pan. Add the salt and all the masalas (red chilli, coriander, cumin, garam masala, and turmeric powders). Toss the contents of the pan until the spices are well-distributed. Place a lid on the frying pan and let the tomato-onion-spice mixture cook for a few minutes, until the oil separates from the mixture (stirring intermittently). Toss in the paneer chunks and stir well, breaking up the paneer in the pan even more as you stir. Cook until the paneer looks well cooked but still moist. You can taste it after a few minutes and decide whether or not you want it cooked some more. Take the pan off the heat. Squeeze lime juice on the paneer bhurji, to taste. It’ll add a bit of tartness to it that I love! 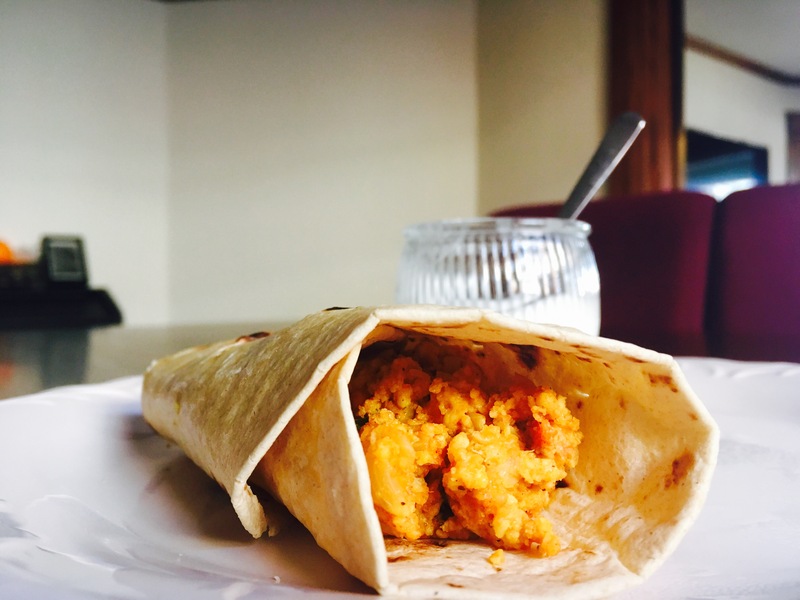 Place a roti or tortilla on a plate. 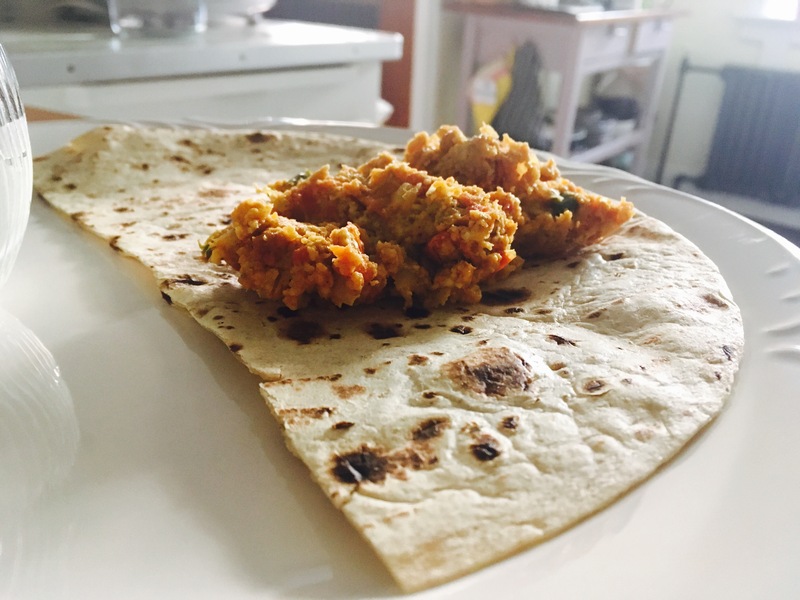 Spoon the bhurji into the centre of the roti. 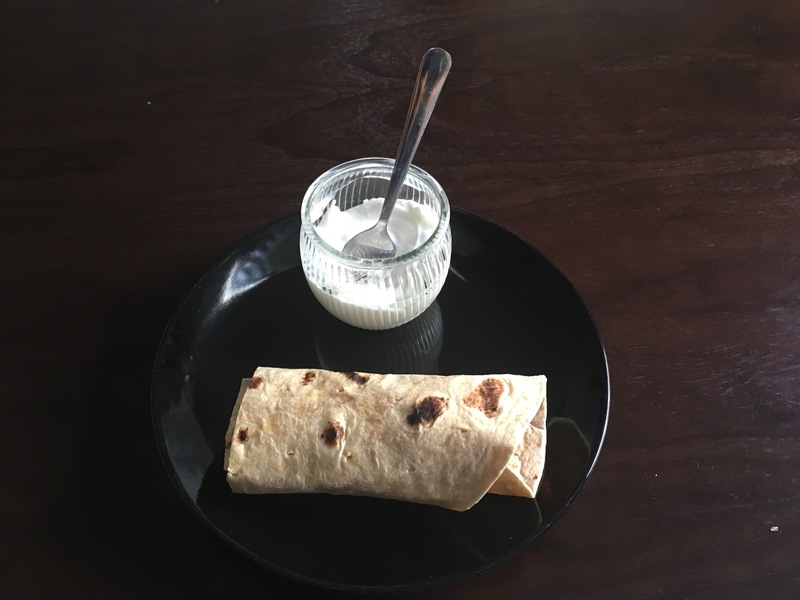 Roll the roti up, so that it looks like a burrito.